Anti-virus and anti-spyware software must regularly update their databases containing information about viruses, Trojans and other malicious software. And with the advent of new, as yet unknown threats, it may take quite a considerable time before the new malware will be included in these databases. This means that your computer at this time would be without protection from keyloggers. And what happens if you can not add malicious software in the database and if a computer spy constantly changing and mutating? This quality is present in elite keyloggers. They are invisible. Sophisticated software keyloggers work in stealth mode and can not be detected by any anti-keyloggers, and even antivirus software. Core of such spyware is daily updating. Internal code elite keylogger is constantly changing, and no one but a cyber-criminal, who established a keylogger does not know that the computer is under observation. In this case, the keylogger will not be seen by any classical security software, whether antivirus, antikeyloggery, anti-rootkits. We will learn now how to find and remove the driver spy on the example of Elite Keylogger and masking software COVERT, which has an internal ability to detect such threats. Run COVERT, click on the “Driver Monitor”. 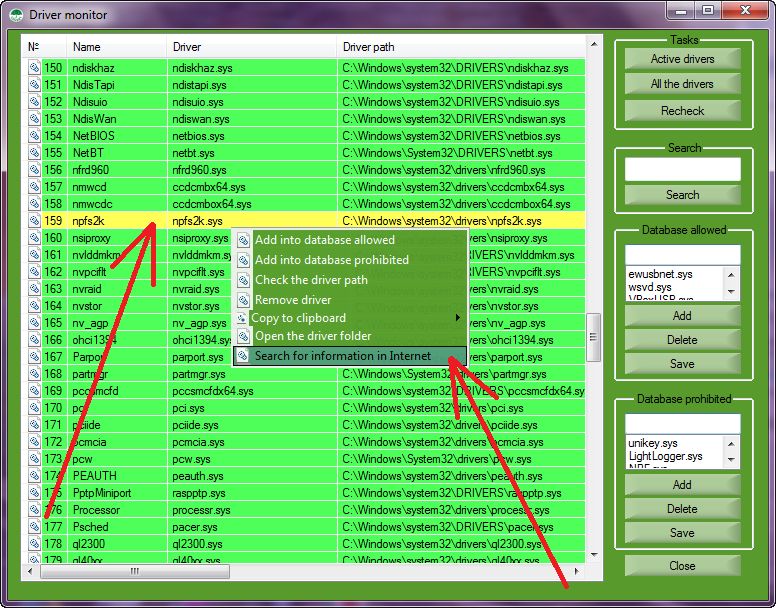 In the opened window, all the items on the list of active file system drivers should be highlighted in green. These lines contain the names and addresses of the drivers that are either system or approved by the developer. Also highlighted in green drivers that approved by the user. If you have everything looks as it does, feel free to come to the platform by pressing the big button with logo COVERT in the main program window. And you can be sure that your system is free from active spies that use the drivers in kernel mode. Here is what you would see in the window of your monitor, if someone has installed on a computer professional Keylogger Elite Keylogger. 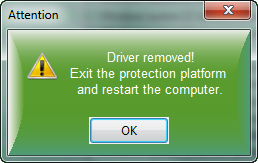 There is a new active driver, it is highlighted in yellow. (Driver, which is not allowed in the database, and is not associated with the work of the operating system will be highlighted in yellow). This suggests that you have in the system unknown driver, and it should be checked. Click on it with the right mouse button and from the context menu, select “Search information in the Internet”. On a dedicated server, which contains information about all system and famous files, you will receive the answer about the origin of this driver. 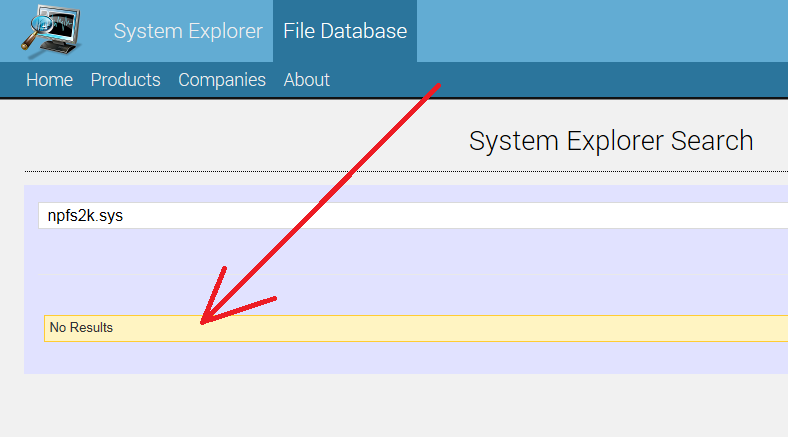 If you have information about the program to which it belongs, known developer, and the path of its installation coincides with the fact, you can add it to “Allowed database” using the context menu. Once the list is updated, authorized driver will be highlighted in green. But information may be absent, as in our case. 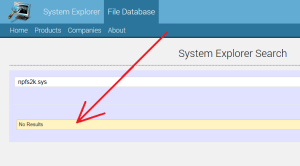 “No results” – file not found in the system and databases of known drivers. That’s right, this is a spy driver Elite Keylogger. It makes no sense to remember this name because on every new installation on your computer, or any other, it generates new names and updates the internal code, which is never repeating. Thanks to this feature, it is simply impossible to add this spy in the antivirus or anti-spyware bases. That is why it is called “an elite spy.” Spies on users’ computers can exist for years without being detected by classical methods of protection. But for COVERT detection of such spies is not a problem. It takes a few seconds to reveal the existing threat on your computer. For masking software does not matter neither the name of the spyware, nor its internal functions. COVERT does not work with databases of malware and defining spyware on totally different criteria. Any driver that is not system and did not belong to any company on earth should not be in your system. Especially if it suddenly appeared. Spyware threat in the form of a filesystem driver has detected, now let’s see how to get rid of it. 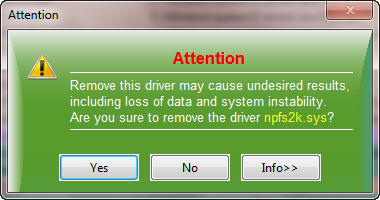 Right-click on the unknown driver and select “Uninstall driver” from the context menu. You will see message with a warning about the danger of such actions. If you are confident in this actions – click “Yes”. After removing spyware drivers, restart the computer and look again in the “Driver monitor”. All items on the list “Active Driver” should be green. If so, Elite Keylogger has been neutralized, it is unable to work and to threaten the loss of information. Watch the video “Presentation of the program”.